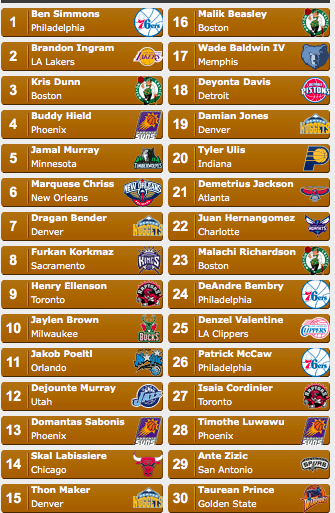 Here is my full NBA Mock Draft, with help from ESPN’s Mock Draft Machine. This mock draft is going to be different from others. I have my whole draft listed above, instead of writing on each pick. I will only be writing on certain picks. Picks that I know the most about the players. I don’t know a ton about this draft, mostly because I’ve been 100% into the playoffs, the fact that I don’t watch nearly as much college basketball as I do NBA, and the fact that this is a really, really bad draft, at least, it is coming into it. The picks I will write on are probably the big names. I wrote a lot about this possibility here, and how Simmons’ possible success could actually turn Sam Hinkie into a true genius. Reports have the 76ers already telling Simmons that he will be their pick. The 76ers have other moves to make (More on that soon). I think once those moves are made, this team will actually start to come together. I’m as high as you can be on Ben Simmons. I think he’s the best prospect since Kevin Durant, and is a do-it-all player. With a little bit of work on his jumpshot, he can become a point-forward. Having a guy that versatile could be able to offset the problem of playing two centers at once. I honestly thought Brandon Ingram should have stayed another year in school. The guy is super raw offensively. The Lakers are gonna be bummed they can’t take Simmons, because Ingram isn’t going to be an instant star. He has a lot of potential, which is this draft in a nutshell. Ingram’s main problem is that I don’t know exactly what he is yet. There’s stages where you have to know what type of player a guy is, and the 2nd is the draft. The next is after three seasons in the league. Ingram hasn’t hit the 2nd stage, and thats worrisome. This makes all the sense in the world. The last thing Boston needs is another big man or guard that they don’t know what to do with. They already have a clogged rotation. It makes sense to have a clogged rotation when its full of good players. Adding Jahlil Okafor gives them another good player. Get rid of Okafor clears up things for Philly too. This way, they can play Kris Dunn, Ben Simmons, Dario Saric, Nerleans Noel, and Joel Embiid together, and not have three true big men of this caliber in the rotation. That lineup works. Noel is more versatile than Okafor or Embiid, so you could play him at the 4-spot. Embiid is kept near the glass. Then you have Simmons and Saric playing small. It should work. This trade makes sense for both involved. Reports have had the 76ers wanting another top five pick, presumably to take a point guard. Kris Dunn is the best point guard in the draft. That guy is NBA ready, too. He’d be a great fit and addition with his readiness, which is desperately needed for such a young and raw team. OK, this probably seems too high for most of you. But I’m a Suns fan and I know what I want. The Suns need a guy who we can park on the wing and have him score. Buddy Hield is exactly that. The guy can flat-out score. He’s exactly what we need. The criticism of Hield is that he can’t create is own shot, or that he isn’t a guard. No, he’s not. Thats exactly what I want the Suns to draft him. Thats exactly what we don’t need. If the Jimmy Butler trade for Minnesota doesn’t go through (At this point, I don’t think it will. ), then the move the Timberwolves make is sliding in Jamal Murray for Ricky Rubio, and shipping Rubio to New York or Indiana or someplace. I think Murray is a true point guard. I think he has the three pieces point guards need. Rubio doesn’t. We’ve been through this. Rubio can’t shoot. Murray can. People are worried about Murray commanding and having point guard vision. The guy is young. He can develop it. And if you’re the Timberwolves, Rubio is practically the oldest guy in the starting lineup. Why not just ship him out and go all with two-or-three year guys? Whats there not to like? Marquese Chriss is the playmaker the Pelicans need. He can play three positions, but isn’t a point-forward like Ben Simmons or Thon Maker. He’s insanely athletic. Its an insane comparison, but there’s a lot of LeBron James in Marquese Chriss. This Pelicans roster is in nasty shape. Chriss won’t immediately turn them around, but will provide some excitement for the fans. Dragan Bender has give me a lot of trouble in this draft. I’ve gone back and forth quite a bit. I don’t like him. I don’t know whether he’s a center, a power forward, a stretch 4, or a versatile player who can play 3, 4, and 5. I think NBA teams should stay away. I’ve scoured the whole first round trying to find a spot for him, and I can’t. So, I had to come up with a stupid trade that features a stupid team. The Kings are perfect. Denver has been connected to Kevin Love and Boogie for awhile, so why not trade this pick, clear out some money and players, and get one of the best centers in the league? Its a dumb trade for all involved, but I think the Kings are dumb enough to do it. And the Kings are definitely dumb enough to draft Dragan Bender. This is basically a scapegoat since I don’t like Bender, am not sure where he should go, and don’t know if Denver has any true needs. The power forward position for the Raptors this past season was a constant holdup. They tried many different types of guys there, and none seemed to work. However, I feel like that problem was lack of talent, not lack of fit. Based off what I’ve watched and read, it seems like Henry Ellenson’s ceiling is Kevin Love. The question remains as to whether he’s a stretch 4 or not. I think this is a risk Toronto should take. You’d hope that no matter what, Ellenson is an upgrade over anyone at the 4-spot. Jaylen Brown is another super raw player in this draft. But he fits what Milwaukee is trying to do. He’s another long and athletic player. But I worry about what else he is. I don’t trust really anything with him yet. However, I don’t think the Bucks care that much. They may be able to take a risk here. We know Jason Kidd can. The Magic do have Nikola Vucevic, who I really like. But Vucevic isn’t liked by everyone and has been floated in some trade rumors over the past couple seasons. Poeltl is a guy that you put down low and surround with shooters. He’s going to be that one big guy down low for the Magic. The Bulls may lose Pau Gasol and Joakim Noah in free agency this Summer, so drafting a big guy makes sense. However, Skal Labissiere is one of the guys who I thought should have stayed another year. He’s super raw all around, and that worries me a bit. Why not stay at Kentucky with one of the best coaches in the sport, and develop yourself a little more? Still, Labissiere and Bobby Portis would be really fun to watch together. Thon Maker could be a lot of things. The only issue is that we’re not sure whether he’s even good. If everything we have heard is true, he’s basically a point-forward who’s 7-1. Yeah, sounds enticing. We don’t know if Thon Maker is really good or not because the only tape we have is shot in a high school gym. And he’s playing against players who might be pickup caliber. Again, it sounds to good to be true. Denver can afford to take a risk. This is the definition of a “We’ll see” pick. I hate Indiana’s current backcourt. I think its the reason they underachieved this season and is part of the reason why Frank Vogel was fired. Take Tyler Ullis here and see if he can force his way into the starting lineup. It sounds likely that the Hawks are making a trade with one of their point guards draft night, so taking Demetrius Jackson here gives them a 2nd guy. Jackson was awesome in the NCAA Tournament, and has the skills to become an NBA caliber point guard. The Clippers struggled to fill their 3-spot all season. Take Denzel Valentine here, let him develop a bit more, and plug him in later in the season. The guy can shoot. The Clippers need that, similar to the Suns. I think the mid-20s is Valentine’s range. If the Warriors lose Harrison Barnes and don’t sign Kevin Durant, they’ll have a bit of a hole at small forward. Andre Iguodala would love to start again, but taking Taurean Prince gives them some depth at the 3-spot.